With the name change from "Burma" to "Myanmar" in 1989 causing confusion, many people are wondering: where is Burma? Burma, officially the Republic of the Union of Myanmar, is the largest country in mainland Southeast Asia. It's located at the northeast edge of Southeast Asia and borders Thailand, Laos, China, Tibet, India, and Bangladesh. Burma has beautiful scenery and 1,200 miles of coastline along the Andaman Sea and Bay of Bengal, however, tourism numbers are far lower than those of neighboring Thailand and Laos. The country was mostly closed off until relatively recently; the regime in charge didn't do much to attract visitors. Today, tourists are flocking to Burma for one simple reason: it's changing rapidly. Although Burma is considered by some to be part of South Asia (the many influences from proximity can be seen), it is officially a member of ASEAN (Association of Southeast Asian Nations). Note: These coordinates are for the old capital of Yangon. Burma or Myanmar, Which Is It? Burma's name was officially changed to "The Republic of the Union of Myanmar" by the ruling military junta in 1989. The change was rejected by many world governments due to the junta's messy history of civil war and human rights violations. Although diplomats and governments once showed disapproval by sticking to the old name of Burma, that has changed. The 2015 elections and the victory of Aung San Suu Kyi's party helped open up international relations and tourism, making the name "Myanmar" more acceptable. People from Myanmar are still referred to as "Burmese." Despite a landmass of 261,227 square miles, the 2014 census found a population of only around 51 million. The capital of Burma was moved from Yangon (formerly Rangoon) to Naypyidaw in 2005. Yangon is still the largest city. The mountains in Burma are home to many precious stones. Around 90 percent of the world's rubies come from Burma. Sapphires and jade are also abundant. Some large Western retailers balk at gems from Burma due to labor conditions. Burma was one of only three countries in the world (including the United States and Liberia) who had not yet adopted the metric system of measurement. In October 2013, the Burmese government announced that they were planning to migrate to the metric system. Burma once had one of the strictest internet censorship policies in the world. Bloggers have been jailed for posting photos that depict problems in the country. Internet cafes would once hold onto your passport as they monitored your web usage. Until 2013, Burma was one of only three countries in the world where you couldn't buy a Coca-Cola; Cuba and North Korea were the other two. Now that Cuba is opening up, North Korea is the last holdout. The 2013 Southeast Asian Games — an Olympics-style competition between the countries in Southeast Asia — were hosted by Burma. The last time the event was hosted by Burma was in 1969. Burma is the second largest exporter of opium in the world (Afghanistan is the first). The Shwedagon Pagoda in Yangon is one of the world's most sacred Buddhist pagodas. The beautiful site is thought to contain relics belonging to four Buddhas, including strands of hair from Gautama Buddha. Burma is much easier for travelers to visit now than it was just a short time ago. ATMs are becoming widespread, and a tourist infrastructure is beginning to develop. Traveling off the "regular" tourist circuit in Burma still proves to be a challenge. The trains in Burma bounce and sway slowly along old colonial tracks. They cautiously cross the hair-raising Gorteik Viaduct. At 335 feet high, it is one of the highest railway trestles in the world. The Yangon Stock Exchange (YSX) came on line March 25, 2016. The political climate in Burma has changed drastically. With the drop in international sanctions, Western companies rushed in and a tourism infrastructure is blooming. Although internet use is still difficult in Burma, the country will undoubtedly change and develop as external influences spread. Visa regulations have been relaxed; you simply need to apply for a visa online before visiting. Land borders with Thailand were opened in 2013, however, the only reliable way to enter and exit Burma remains flying. Flights from Bangkok or Kuala Lumpur are the most popular. Visiting Burma is still very inexpensive, although backpacking travelers accustomed to other places in Southeast Asia find that accommodation is more expensive when traveling solo. Teaming up with another traveler is the cheapest way to go. Getting around is easy, although you won't encounter many English signs in transportation stations. Tickets are still done the old-fashioned way: your name is written into a giant book with a pencil. 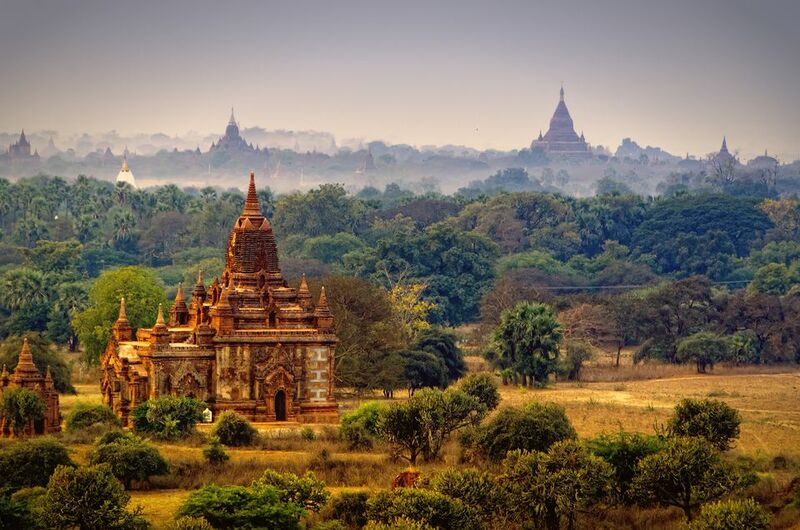 In 2014, Burma introduced an eVisa system that allows travelers to apply online for a Visa Approval Letter. If approved, travelers simply need to show the printed letter at an immigration counter to receive a visa stamp for 30 days. Some regions in Burma are still closed to travelers. These restricted areas require special permits to enter and should be avoided. Despite the regime change, religious persecution is still a violent problem in Burma. Although international flights from Western countries to Burma are still practically nonexistent, there are excellent connections from Bangkok, Kuala Lumpur, Singapore, and other major cities in Asia. A long list of airlines services Yangon International Airport (airport code: RGN).